The RollerMouse is a unique and highly effective ergonomic pointing device that helps prevent strain and tension of upper extremity muscles including shoulders and elbows. It is a remarkable way to control the cursor without the need to grip or reach for a mouse, and requires minimal space. Available in two versions, Pro and Classic. The Pro rollerbar is 67% longer than the Classic and has 5 buttons instead of three. The Classic is ideal for individuals with smaller shoulder widths and who want to connect a PS/2 mouse directly to the unit. Both versions are USB and PS/2 compatible. RollerMouse Classic Features: The RollerMouse utilizes a rollerbar that controls the cursor and can be manipulated with either the thumbs or the fingertips, requiring no gripping. The RollerMouse also helps eliminate repetitive reaching for a mouse, trackball or touchpad because its controls are centrally located beneath the space bar. Features Include: Revolutionary rollerbar provides single finger point and click functionality. Adjustable click force on rollerbar (5 levels of tension) using simple knob under RollerMouse (Rollerbar click function can be disabled using dip switch if user prefers using buttons). Smooth sliding steel rollerbar coated with soft rubber for excellent feel and cursor control. 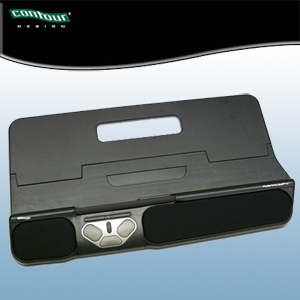 The PS2 port located on the side of the RollerMouse allows connection of a standard input device (mouse, touchpad or trackball), enhancing ergonomics and usability. This flexibility allows the user to easily alternate the workload to different muscle groups throughout the workday. Built to last. Optical sensor reads bar movement using the latest technology; nothing to wear out. 3 user definable buttons and a scroll wheel. Soft but firm lycra® wrist rest support is removable for easy cleaning. Button Actions: In Standard mode, the RollerMouse buttons function as follows:The roller bar performs left mouse clicksThe left grey button performs left mouse clicksThe middle grey button performs a double clickThe right grey button performs a right clickThe clicked scroll wheel performs middle clicks Dimensions: 20-7/8" (53cm) wide x 11-3/8" (29cm) deep x 1-1/4" (3cm) high. Keyboard sold separately. See more products from North Coast Medical Inc.
Purchase this product from North Coast Medical Inc.